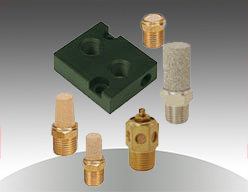 The Flow Line Controls NP1/4 converts Namur air inlet mounting pads to 1/4" NPT connections. Typical applications include converting Flow Line Controls NV62 Block & Vent valve, NV42 Air Lock valve and NF Series Flow Controls from Namur to 1/4" NPT. The NP1/4 is not required when an NV or NF Series component is 'sandwiched' between a Flow Line Controls Series 20/21 actuator and a Flow Line Controls Series 50 solenoid valve. Flow Line Controls breathers prevent dirt and foreign material from entering open 1/4" and 1/2" NPT ports in pneumatic actuators, solenoid valves and other equipment. Flow Line Controls mufflers provide an additional benefit of reducing noise to acceptable OSHA limits.